I have found that using 2x Merlin's Summon is excellent for collecting sparks. Please let me know what other power discs (1.0, 2.0 or 3.0) are particularly powerful for game play when doubled? I want to get a few doubles of the really handy ones but I do not want to collect two of every single ability disc. Obviously the costume ones wouldn't be relevant here. I appreciate the feedback thanks. 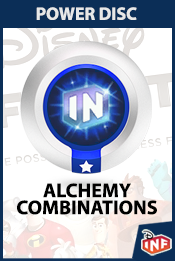 possible Disney Infinity Power Disc Alchemy combinations. Power Disc Alchemy is a feature that is a result of two power discs being used under your character creating a third effect. Not every combination yields an alchemy effect and two of the same disc never will yield a third, just double the effect of the disc which in most cases just doubles the chance of the effect taking place. 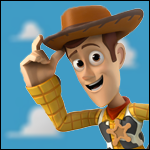 Some effects are possible to create creating different discs (ex: Felix+Any economy boosting disc) and some are exclusive to specific characters (Ralph+Felix, Buzz+Zurg). A big thanks to for putting together the initial list and sharing it with us to expand. 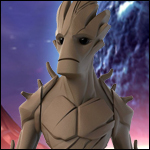 There are a couple that have two versions, such as Spark Shield and Improved Spark Shield. It is unknown for right now if it's better in terms of sparks earn or frequency of it happening. Thanks. I knew about the alchemy but its nice to see it listed here. What i am asking does anyone play with two of the exact same power discs on there character. If so, which one and why?